This time we explore the air, or aria as it is called. More commonly, aria refers to a piece of vocal music, but it can also be an instrumental work. There is no set form for an aria. It could be a strophic song like you heard in Room 22. It might be through-composed, meaning that it goes straight through from beginning to end without the repetitions you would expect with verses. 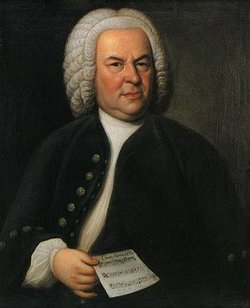 Here's a picture of the great picture of the great Johann Sebastian Bach (1685-1750). The word "Bach" in German means a brook; someone joked long ago that Bach wasn't a brook, he was an ocean of music. Its very true because he delved into many different musical forms and was a master of all of them. We're going to hear one of his most memorable pieces, the Air (or Aria) from the Orchestral Suite No. 3 in D major. The form in this piece is AABB. Here's a timetable for events in this piece. The aria is a lovely piece of music. Did you notice how the song-like quality of the melody is matched by the processional-like quality of the bass line which marches slowly along beneath? Did you also notice how the calmness of the A section is balanced by the tension that is created by the nature of the melody and harmonies in the B section.